Recently, ButterflyCircle member Bobby Mun was on an outing alone at the Southern Ridges when he spotted a familiar shaped of a butterfly that resembles one of the Eggflys. On closer inspection, he realised that the white patches on the wings were more extensive than the more common species of the genus Hypolimnas. He was able to take a shot of the butterfly before it took off to the treetops and flew out of sight. Upon checking the shot later, it was confirmed to be the long-missing Danaid Eggfly (Hypolimnas missippus missippus). The Danaid Eggfly is shown as extant in Corbet & Pendlebury's 4th Edition of the "Butterflies of the Malay Peninsula". However, a male specimen of the Danaid Eggfly was only recorded with certainty by Steven Neo in 1994 in the Mandai Road area. The species has not been observed since then. It was therefore a pleasant surprise that Bobby spotted this species and also most fortunately managed to take a good shot of the butterfly. 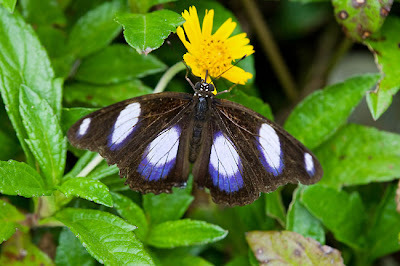 The Danaid Eggfly is described as "rare" in WA Fleming's "Butterflies of West Malaysia and Singapore". 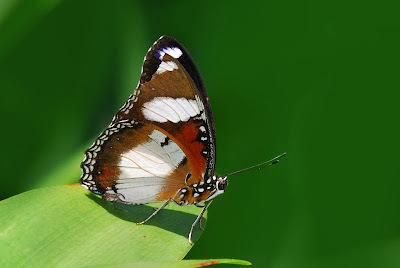 The male of the species resembles that of the Great Eggfly and Jacintha Eggfly. But on the hindwing beneath there is a black costal spot that is present in the Danaid Eggfly. 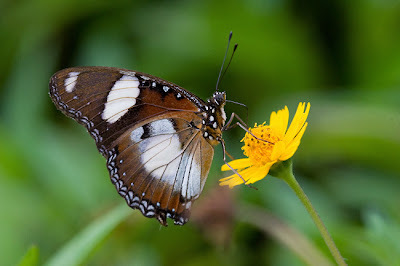 The female of the Danaid Eggfly is an almost exact replica of the Plain Tiger (Danaus chrysippus chrysippus) which it mimics. It has a wide geographical range, starting from the American mainland to Africa, West Indies, Sri Lanka and South East Asia. ButterflyCircle is pleased to report the sighting of this rare long-missing species, and hopes that more frequent sightings of the Danaid Eggfly will follow.